Spain is a diverse country sharing the Iberian Peninsula with Portugal at the western end of the Mediterranean Sea. It is the country with the second-largest number of UNESCO World Heritage Sites after Italy and the largest number of World Heritage Cities. With all the great places to visit here, going for a holiday or cultural visit to Spain will prove to be a rewarding experience for anyone. 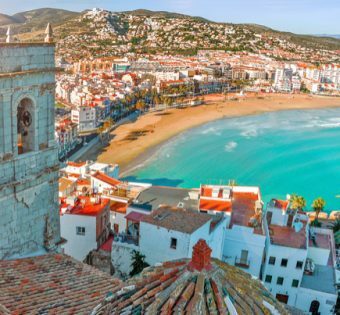 Spain is considered an exotic country in Europe due to its friendly inhabitants, relaxed lifestyle, its cuisine, vibrant nightlife, and world-famous folklore and festivities. Among many places worth visiting are Spain's thriving capital Madrid, the vibrant coastal city of Barcelona, the famous "Running of the Bulls" at Pamplona, major Andalucian cities with Moorish architecture, like Seville, Granada, and Córdoba, the Way of St. James and the idyllic Balearic and Canary Islands. With great beaches, fun nightlife, many cultural regions, and historic cities, Spain make a great destination for any kind of trip. A country of large geographic and cultural diversity, Spain is a surprise to those who only know its reputation for great beach holidays. There is everything from lush meadows and snowy mountains to huge marshes and deserts in the south-east.